Happy New (Calendar) Year! We hope you all had a great Christmas season. The December quarter saw the ASX200 finally break through the 6,000 point barrier. The last time the market closed above 6,000 points was in January of 2008, almost 10 years ago! The ASX200 started the 2017 calendar year at 5,773 points and has closed the December quarter at 6,065.30 points. This is a gain of 292.3 points or 5.06% over the twelve month period. The gains all occurred during the second half of the year with the ASX200 jumping 6% since 1 July 2017. Out of favour sectors including Resources, Energy and Retail are all providing strong performance. BHP’s share price jumped from $25.78 to $29.57 or 14.7% for the three month period 1 October 2017 – 31 December 2017. Rio Tinto jumped from $66.53 to $75.81 (13.95%) and Harvey Norman’s share price jumped from $3.88 to $4.17 (7.47%) for the quarter. Financials have proved to be the biggest negative on the market with speculation around the banking enquiry continuing to drag the market down. 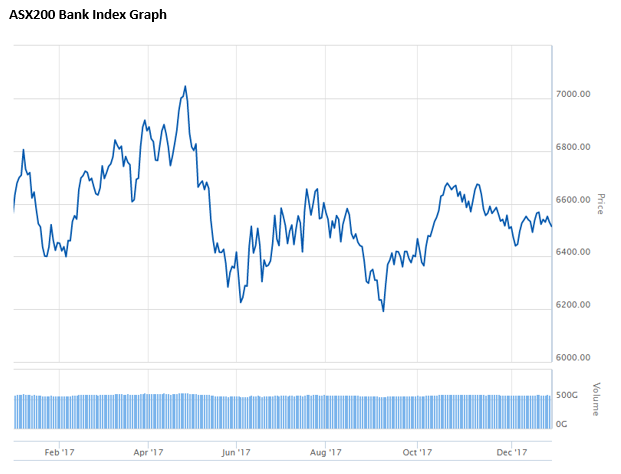 The announcement of a Bank Levy also weighed heavily on the market when announced in the Federal Budget in May as demonstrated in the below graph. Australia’s gains were modest however, compared to the US Dow Jones Industrial Average Index which soared throughout 2017, growing 24.39% for the year. Love him or hate him, since Donald Trump’s election the US share market’s growth has been spectacular and more can be expected now that his promise of massive tax reform proposals has been passed. US corporate tax rates are to be cut from 35% to 21% as well as tax cuts at the personal level. These new tax concessions more than offset any concerns about US interest rates nudging upwards after three interest rate increases by the Fed in 2017, with the third increase coming in December and more US interest rate rises expected in 2018. The tax cuts in America should prove positive for the Australian share market with many companies that we invest in (such as CSL, Aristocrat, Macquarie and Boral) deriving income from the US. 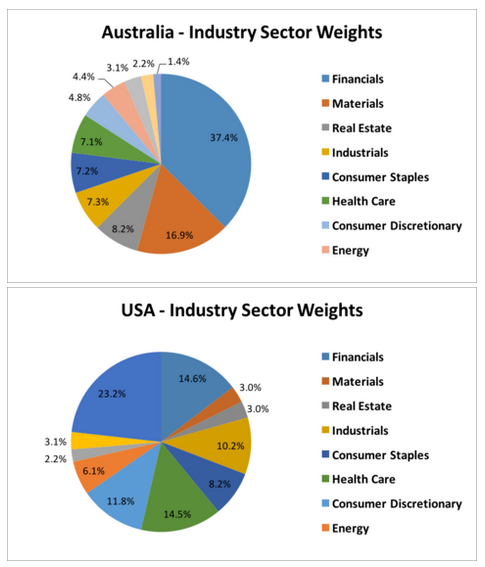 We have included below a graph detailing the Industry Sector weights for Australia and the USA. As demonstrated below, the makeup of the stock exchanges are very different with the underperforming financials sector making up over 37% of the Australian Share market. 2017 was a year of slow-and-steady economic growth, growing by 2.8% by the end of the September 2017 quarter. The December quarter results are yet to be released, however consensus expects the quarter to achieve growth of around 0.6%. A steady increase in business investment throughout 2017, rising 7.7% for the year, is the best outcome and spending from the public sector has helped this growth. All indicators suggest that positive business investment will continue for the next 2 years, albeit with quarter-on-quarter volatility, as conditions continue to improve. The employment rate at the end of November 2017 was 5.4% – a 56-month low. The labour force participation rate also rose to 65.5%, exceeding expectations by 0.4%. Although businesses are spending more and the unemployment rate continues to fall, this is not translating to higher household incomes just yet. For the September 2017 quarter, consumer spending rose insignificantly by 0.1% – the worst result since 2008. Wage growth is near record lows, despite the minimum wage getting a boost in July 2017. To add insult to injury, economists are pessimistic on the outlook for any significant upturn in wages in the near future. Nonetheless, all industries to the end of September 2017 saw wages growing ahead of inflation which is also at historically very low levels. The cash rate was kept on hold for the entire year at 1.50%, although banks started to raise their interest rates during 2017 independent of the Reserve Bank of Australia (RBA) decisions. The RBA are still very, very cautious to raise rates whilst wage growth is low and household debt is high and property prices coming off. We expect the cash rate to remain on hold for some time yet. Looking ahead, our economy is expected to continue to grow and improve into 2018. The uncertainty households carry about wages and increasing debts will continue to be a headwind. Conversely, continued business investment, government spending and, as a result, a declining unemployment rate should see continued growth. 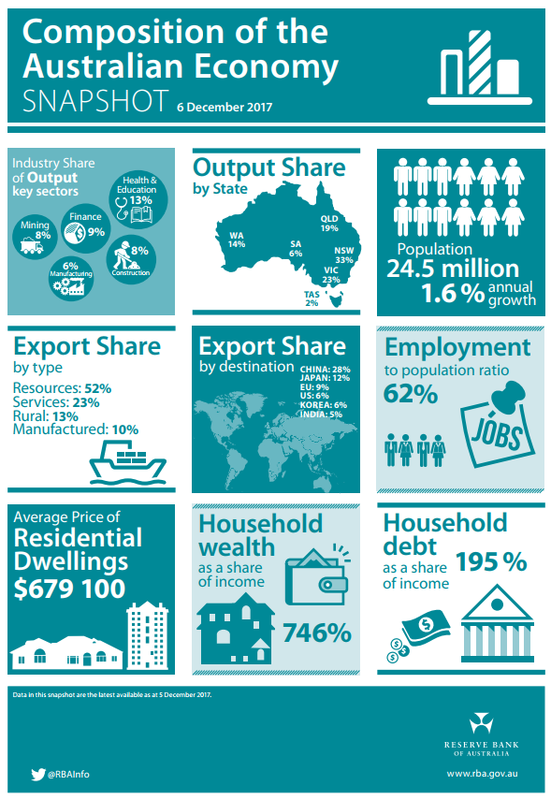 The RBA released the below infographic on 6 December 2017 which illustrated the current composition of our economy. 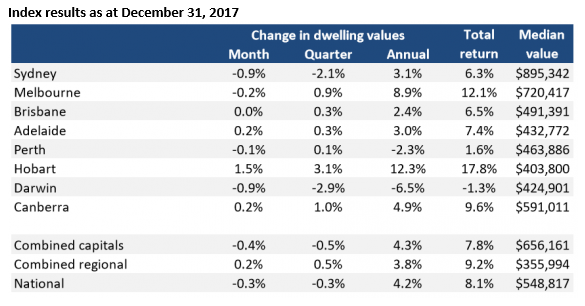 National Dwelling Values fell 0.3% In December, setting the scene for softer housing conditions in 2018. The transition towards weaker housing market conditions has been clear, but gradual, and is likely to continue throughout 2018. From a macro perspective, late 2016 marked a peak in the pace of capital gains across Australia with national dwelling values rising at the rolling quarterly pace of 3.7% over the three months to November. Nationally, dwelling values were 4.2% higher over the 2017 calendar year which is a slower pace of growth relative to 2016 when national dwelling values rose 5.8% and in 2015 when values nationally were 9.2% higher. While property values increased over the 2017 calendar year we saw growth rates and transactional activity gradually lose steam, with national month-on-month capital gains slowing to 0% in October and November before turning negative in December. According to CoreLogic, the 0.3% fall in December was the catalyst for dragging the quarterly capital gains result into negative territory for the first time since the three months ending April 2016. Across Australia, the shift to falling national dwelling values is being driven by the capital cities, with the combined capitals tracking half a percent lower over the December quarter, while across the combined regional areas of Australia, values were half a percent higher over the quarter. Amongst the capitals, the weakest conditions are concentrated in Sydney and Darwin. Sydney’s housing market has become the most significant drag on the headline growth figures. Sydney dwelling values were down 0.9% over the month to be 2.1% lower over the December quarter and 2.2% lower relative to their August 2017 peak. The city’s annual rate of growth is now tracking at just 3.1%; a stark difference to the recent cyclical peak when values were rising at the annual rate of 17.1% only seven months ago. Despite the reversal in growth rates since August 2017, Sydney dwelling values remain 70.8% higher than their cyclical low point in February 2012.